Was watching the Prizoner of Azkaban film the other day and was struck by how cool the daily prophet looked so i tried my hand at it. Most of the txt is from the books some of it is by me. photos of course are from the film. as for spelling mistakes.... um.. they're all intentional... it's the wizard spelling of the words... yeah... all characters and names are jk rowlings. I'd like to use your work to demo an AR app at a developer conference. May I obtain your permission for that? Excellent work, worthy of the Wizarding World! This is so amazing! Is it possible to get it as a psd (or whatever u used) download? I'll Of course credit you! Hey, cheers for the comment. Unfortunately I did this soooo long ago that the source files are loooooong gone! Sorry! This is brilliance. 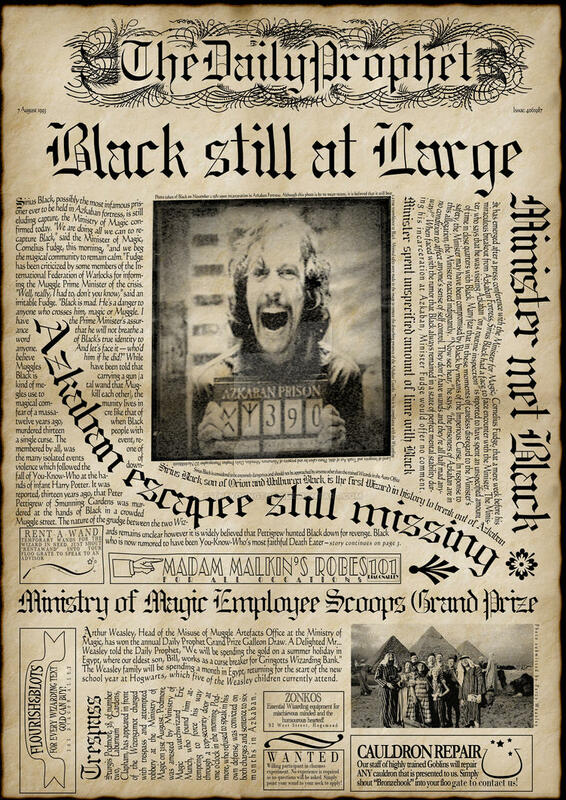 I was googling 'daily prophet azkaban' for inspiration as my cousins and I are in the middle of doing a fan film about the place, and I was going to attempt a front cover like this one with our own photos and stuff so I'm properly inspired now! When you make your one be sure to send me a link i'd love to see it! yeah i made this simply for fun, glad you like it. Again, amazing! Love the little Rent-a-Wand ad, it made me chuckle. Great minds man, i am also throwing something of a Potter party for the last film. w00t! It was really sweet to say what you've said your praise is much appreciated. As for the colouring of the paper i just google imaged the word 'parchment' et voilà! Once you create your invitation be sure to post it on here to show us all what you've done. Good luck! Oh man. This is so amazing! I am getting ready to throw a huge HP party for the last movie and was looking for inspiration on how to maybe make my invitations and I came across this and thought I would sign up to this sight just to say what an amazing job you did. I have some basic graphics design classes under my belt and know just how difficult and time consuming this project must have been. So Kudos man. I also loved your proclamation sign. Was wondering if I could use that image or the idea as my invitation. how are you making the coloring for the paper? Ok, thanks again for such an awesome job and inspiring some new ideas for me. How did you manage to format the text in such a way? I've been planning to make a replica of both the Daily Prophet and the Quibbler but I'm finding it difficult to format the text. Also, what font did you use? Thanks. Hi, it's been a long while since i did this so i dont remember what fonts i used. As for how to get the text to follow a path i used Adobe Photoshop. I couldn't help but use it as part of a wallpaper. Hope you don't mind. No not at all, i'd love to see it! Thanks again for making this amazing Prophet! I tried to do this, but then realized that slitting my wrists would be so much more pleasant. Kudos to you. This looks AWESOME. I plan on creating an art piece with an LCD screen built into it to give the headline photo of the daily prophet the realistic movement of the movie version. done. you're art piece must be non profit. i dont wanna get in any kind of trouble. Would you consider offer this up? i am trying to make an art piece using daily prophets for my daughter (she loves HP). i'm sorry, but what does "offer this up mean"? This is easily one of the best 'Daily Prophet's' on the net. Great work. I've been looking high and low for a Daily Prophet wallpaper (it's so wonderfully crazy in it's layout) but after this, I reckon I'll have a go at making my own. Cheers for the inspiration. hi how do you do this? i want to make a daily prophhet and put it up on a facebook group i have created. photoshop text and image layers. just google some text path tutorials. Nice work. I made a Daily Prophet for my friend for her birthday. Isn't text wrapping a pain in the backside!!... or did you make this by hand? in which case I'm even more impressed! no i didnt do this by hand and yes text wrapping is a pain! im glad you like it. Waow, very good work! You really watched the details. You maked a really good job!! thanks, glad you like it. yeah im all about the seemingly random details.